On 28 May 1998, Pakistan conducted five simultaneous underground nuclear tests in the Ras Koh Hills in Chagai District, Baluchistan. Though there had been rumblings of Pakistan already possessing – and even testing a live nuclear weapon – as early as 1990 (via Chinese support), Pakistan made it unambiguous as it responded to India’s nuclear detonation tests (which occurred on 11-13 May 1998). 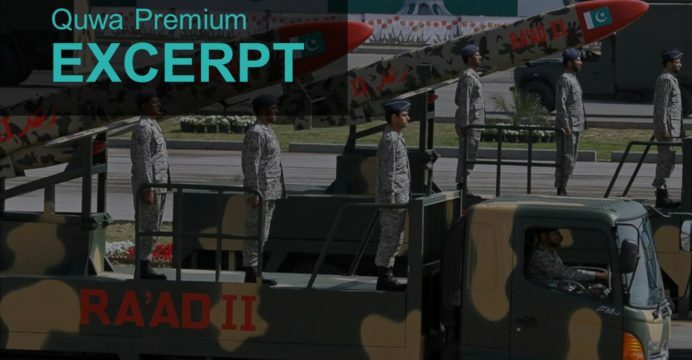 What followed Pakistan’s tests, designated Chagai-I, was two decades of continual development of the delivery mechanisms and warhead technology, controversy (or crisis) on proliferation and struggle to gain worldwide legitimacy – and the benefits it brings – as a respected nuclear power. Pakistan succeeded in some areas, such as miniaturizing its warheads (by completing plutonium warhead development) and enabling its aircraft, ships and submarines to be stand-off range delivery platforms. However, it continues to struggle in its efforts to gain the kind of acknowledgement that simply translates into expanded access to nuclear technology and fuel resources. This article is a primer to the many issues feeding into Pakistan’s nuclear weapons program. Throughout the month of May, Quwa will release a series of detailed articles – as well as its monthly report – on the history, development, realities and future prospects of Pakistan’s nuclear weapons program. Following the wars of 1965 and 1971, Pakistan’s security intelligentsia and establishment (i.e. its decision-makers) concluded that alliances, no matter how apparently ‘strong’ or ‘deep’, are not true guarantors of Pakistani sovereignty and territorial integrity. In his book Eating Grass, retired Pakistan Army Brigadier General Feroz Hassan Khan stated, “Pakistan found international institutions capricious and alliances unreliable.” In effect, a nuclear deterrence would be Pakistan’s only absolute guarantor of its sovereignty; but pursuing – and even possessing it – drew consternation, particularly from the US. In a sense, the Pakistan nuclear weapons program is a strong reflection of Pakistan’s historical difficulties in cultivating a strong foreign relations presence. Granted, both India and Pakistan were hit with various sanctions from the US – and to a lesser extent, Western Europe – for their respective programs, but India has evidently emerged in a comparatively better position in terms of being accepted as a nuclear power. One need only look at India’s entry into the Wassenaar Arrangement and the Missile Technology Control Regime (MTCR), which now afford it with both foreign relations credibility and technology access. The complete article is available to Quwa Premium subscribers here. C. Uday Bhaskar. “Column – Southern Asia’s nuclear myths revisited post bin Laden”. Reuters. 13 May 2011. URL: https://www.reuters.com/article/idINIndia-56998720110513 (Last Accessed: 03 May 2018).